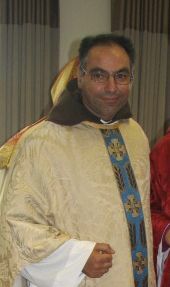 Fr Francis is a priest serving in Edinburgh and East Lothian. A brother of FMC it is often noted that his first name is ideal for his serving as a Franciscan. Fr Francis joined us by incardination and works a ministry of outreach and support for the needy and lonely. Serving in the diocese of Fortriu & Dalriada and in the Franciscan Missionaries of the Cross, Fr Francis has a practical emphasis to his serving....and if necessary, uses words.